Many important topics are covered in a school building on a daily basis. Students learn about math, reading and writing, home economics and even receive counseling and therapy, to name a few. And while plenty of focus is still placed on those concepts, one program has received more focus and emphasis as of late, especially in New Story’s West Region schools. Transition programs, where students learn life and job skills designed to be applicable outside of and beyond school, are receiving more attention across the globe, and New Story’s West Region has dedicated a lot of time, money and effort in growing its own transition program in order to properly prepare its students. Students aged 14 and older are eligible for the transition program, which puts students through various training sessions inside and outside of the classroom so that they can learn applicable life and job skills. Each school is equipped with an apartment-like setting where students can learn the day-to-day tasks of tending to a home space. Skills learned in this setting can include: making a bed, cleaning floors, cooking and washing dishes, loading and unloading laundry machines and setting and tearing down tables, among others. Outside of the classroom, transition students are integrated into community life, where they can perform jobs at various businesses. This provides the students not only with an opportunity to help out in the community and to form relationships, but it also gives them the chance to earn hands-on training. 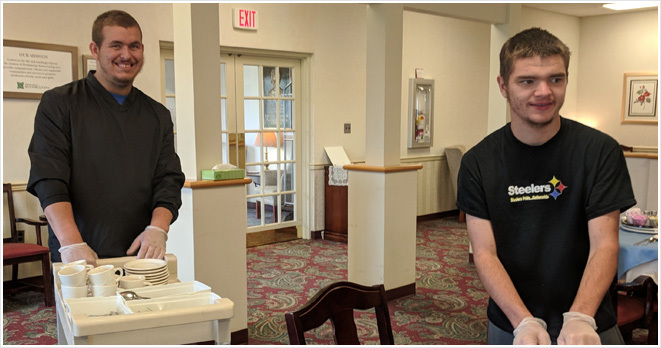 New Story works with local businesses such as TJ Maxx, Goodwill and many nursing homes to provide working opportunities for its transition students. In these situations, students learn tasks such as setting up and tearing down cafeterias, racking clothes, and cleaning, among others. New Story’s West Region has had an active transition program at its Indiana, DuBois and Monroeville schools for the better part of the last decade. But an emphasis on and expansion of the program has gone into effect this year, which has included the beginning of a transition program at New Story’s Clearfield location and the forming of more relationships within communities. Expansion of the program has included field trips to and presentations from the OVR (Office of Vocational Rehab) and the Hiram G. Andrews Center. Promoting in-class discussion and academic experiences outside the classroom, including involvement in co-curricular activities and community partnerships. Gaining knowledge about ourselves and the communities we live in by learning directly in those communities. Increasing confidence, self-worth and community involvement through a team-oriented, yet, individual-based program. For more information on New Story’s transition program or to find out if you or your business can become involved, contact Transition Coordinator Justin Maseto at (814) 371-5414 or jmaseto@newstory.com or you can reach out to Marketing Coordinator Justin Gerwick at (724) 463-5390 x227 or jgerwick@salisburymgt.com.